Description: One of the earliest available county maps of Herefordshire taken from Saxton's survey and engraved by William Hole for Camden's "Britannia". Coloured. 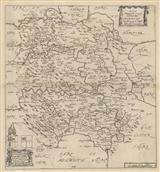 Description: Whimsical county map covering the area of Herefordshire, Taken from Michael Drayton's allegorical poem of England and Wales "Poly Olbion". Charming map illustrated with nymphs and peasants. Coloured. Description: Decorative county map of Herefordshire reduced from the first printed map of the county by Christopher Saxton. Engraved by William Hole for a new edition of Camden's "Britannia". Coloured. Description: RARE County map. Roger Rea Edition. Description: Herefordshire, based on Christopher Saxton and John Speed's surveys, published during the time of the Restoration. Listing of the county hundreds and dedication to Right Hon. Thomas Lord Coningesy. Coloured. 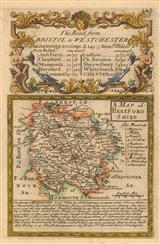 Description: Attractive and rare map of Herefordshire with a dedication to the Bishop of Hereford. Description: Charming county map of Herefordshire with decorative cartouche. Coloured. Description: County map. Decorative borders. Description: County map of Herefordshire flanked with early British coins. Coloured. Description: County map. Decorative detail and description. Description: County map of Herefordshire with the roads, both completed and under construction, marked. Dedicated to Lord Carpenter by the mapmaker, Thomas Read. Coloured. 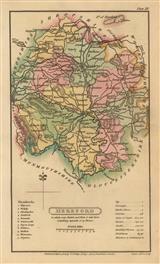 Description: County map with full original hand colour and numerous notes providing information. 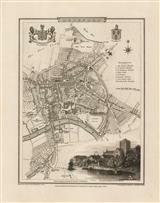 Description: Town plan of Hereford with vignette of Hereford Cathedral from the Wye River. Fair impression. 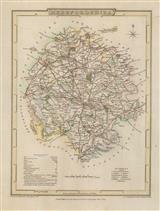 Description: Herefordshire, a detailed and attractive county map published in the early 19th Century. Original colour.